I once knew a lady who prayed every day for emotional composure. Emotional composure: The ability to control her desire to cry. I think of that phrase every time I stand at the end of a cross-country race as the runners finish, some flushed with victory, others merely exhausted, and try to choke back tears. Five years ago my daughter’s eighth-grade social studies teacher changed the course of her high school career. Not only did Mr. Bozarth instill in Emily a love of history, he also persuaded her to join his cross-country team the next year. She’d never raced before, but it didn’t matter. Cross-country is the rarest of things: a sport that doesn’t cut players. If you’re not a varsity or JV runner, you run on the c-team. All three teams matter when it comes to winning meets. 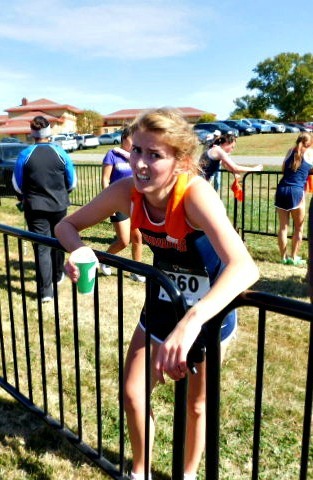 Emily joined cross-country at a good time. The girls’ varsity team won the state championship that year, guided by a few seniors who were natural-born leaders. They made sure every runner felt welcome, no matter their age or ability, and that sense of family meant the world to my daughter. The first meet of her freshman season took place on a Thursday afternoon in 104-degree heat. Emily finished at the back of the pack—last on her team—and threw up in the chute. I missed the emotional composure mark by a mile that day, tears running down my cheeks as I held my fainting child. She toiled at the end of the line the entire season, and I met her at every finish with a face full of repressed emotion. At her age I would have given up in the face of such discouragement. To her everlasting credit, she soldiered on. Slowly, steadily, Emily improved. Over the next three years she met goals and passed milestones that made my heart sing and my eyes flood with tears. She followed the example of her older teammates and became a leader, encouraging the younger runners to do their best. She stayed on the c-team, an honorable spot, and finally rose to the front of the pack as a senior. [/caption]While varsity cross-country teams move on to the regional and state meets, the c-team season ends at the league championship, held every year at Rim Rock farm. Rim Rock has a little bit of everything: hills, fields, trails through the woods, not to mention two covered bridges and a historic cemetery. Finishing at Rim Rock is an accomplishment. Winning there is an honor. Last Saturday, Emily ran her last meet at Rim Rock. She finished well, looking strong, with nothing to regret. She leaves a bright legacy, not only on her team, but in our family, too. 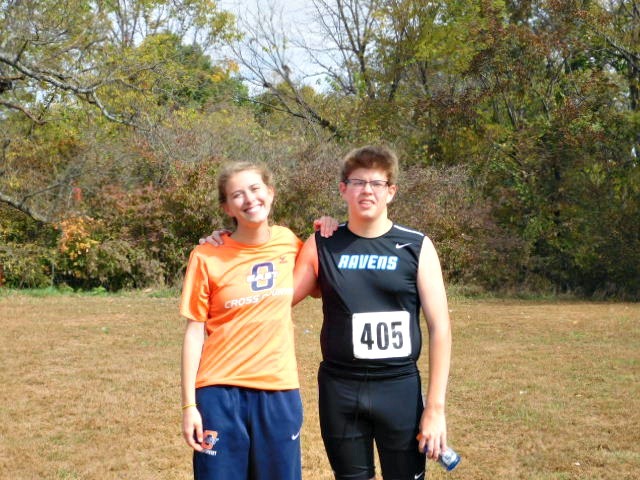 You see, last Saturday marked the end of her brother’s first cross-country season. Matt, a freshman at a different high school, had his own reason for joining cross-country. He’d fallen into sedentary habits and wanted to change his couch-potato destiny. Running was his idea. I frankly doubted he’d stick with it. In June, when he started summer runs with his team, his leg muscles screamed in pain. He couldn’t finish a mile, but he did not quit. In July, he ran on his own, making little progress. He sat out the first meet of the year because his coach did not think he was ready. And so it happened that Matt’s first cross-country race took place on the same course as his sister’s, on a similar August afternoon. When Matt finally jogged into view I let out a cheer, screaming and hollering like he was the front runner, I was so glad to see him. I wanted to laugh and cry at the same time at the sight of my boy finishing his first 5-k. I didn’t care if I embarrassed him. Maybe he’d run faster to get away from his lunatic mother. He crossed the finish line second-to-last, and waited at the end of the course to shake the hand of the guy behind him, a cross-country move if I ever saw one. After that meet, Matt’s season improved by inches, his greatest victory the fact that he never gave up. [/caption]Last Saturday, as I waited half-way up a Rim Rock hill for Matt to run through, a mom from another team stood a little way off. The last runner on her team had already passed, but when Matt reached the top of that hill, she was there, urging him on. “Thanks for waiting,” I said. I smiled at her with that familiar lump in my throat as I finally understood why those races make me cry. It’s a matter of the heart. I loved this. I of course cried as I read it. You have such a tender mother’s heart Jane. Thank you, Donna! And I cried as I wrote it, too. Thanks for sharing that, Tina! Oh, the t-shirts, Mary Ann! You must know that your runners paved the way for mine within the family. Oh, gosh. My eyes are leaking and I’m in a public place. Ah, who cares? That was simply beautiful, Jane! Thank you! So beautiful! These lessons of perseverance will follow them through life – and the memories will always warm your heart. I would love your company for some of those meets, Becky! Your kids, like you, didn’t give up even when things got hard. Great read, Jane!